We’d love your help. 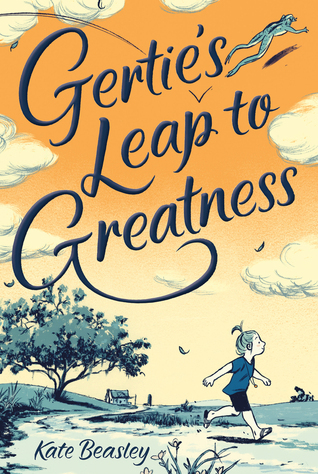 Let us know what’s wrong with this preview of Gertie's Leap to Greatness by Kate Beasley. Gertie Reece Foy is 100% Not-From-Concentrate awesome. She has a daddy who works on an oil rig, a great-aunt who always finds the lowest prices at the Piggly Wiggly, and two loyal best frien For fans of Three Times Lucky and The Penderwicks, this endearing new classic spins together sparkling humor, sizzle-pop writing, and a sassy main character with an unforgettable voice. To ask other readers questions about Gertie's Leap to Greatness, please sign up. Sometimes you read a book and it reminds you of why children's literature not only matters, but is vital to the lives of young readers. Everything you have heard about this book is true. I was in love with Gertie before 20 pgs had gone by. My heart felt for her. I often wanted to give her a hug. She made me laugh and smile. You will want to read this book. You will want to read this book out loud. You will want to pass this book on to readers. Gertie is bound and determined to be "great". The book starts with her resuscitating a bullfrog and taking it to school in a shoebox so that she has the best summer story to tell. Unfortunately, 5th grade is marred by the appearance of a new girl, Mary Sue, whose father is a film director in town with a famous kid star. Gertie wants to be phenomenal so that her mother, who walked out when Gertie was very young, notices her before she moves away from town. Gertie tries being the best student, being the star of the class play, and just about anything else she can, but her innate personality works against her. When Mary Sue's mother, an environmental lobbyist, speaks to the class about trying to shut down the oil rigs on which Gertie's father works, she realizes that she needs to be great for many reasons, even if her mother still ignores her. Strengths: I loved that Gertie had a nontraditional family (her aunt lives with her and her father) that is still very supportive. The teacher is also portrayed as generally fair, even when Gertie points out an incident where she was NOT fair. The fighting with Mary Sue is very on point, as was the fight with a former best friend who aligned herself with Mary Sue. Weaknesses: I disliked Gertie. She did not come across as a sympathetic character to me. Others (who like Hollis Woods and other unpleasant fictional characters) will disagree. I read Gertie all in one day yesterday! Couldn't put it down. I was fighting for her, and for a while was disgusted with her teacher, until later in the book. The teacher in me just did not like her rivals! It is a very special book, and the ending left me wanting more Gertie! Fabulous! 5 stars! Opening Line: "The bullfrog was only half dead, which was perfect." 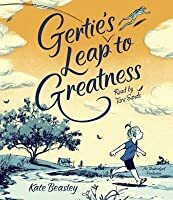 Gertie's Leap to Greatness reads like a classic story with a memorable main character, strong messages, and has the same appeal of a Ramona Quimby book. I can see this as a class read along. One of my favorite scenes was Gertie's reaction to her Aunt serving peas for dinner, the very same reaction I would have had at her age. What makes it most fun are the black and white illustrations by Jillian Tamaki. While reading, I really couldn't help feeling for poor Gertie, she struck me as a very lonely girl. Like Gertie, I was trying to understand why her mother left in the first place, and those feelings that Gertie had of not feeling like she wasn't important enough for her mother, really made me want to give her a really big hug. The sad thing is there are kids out there now who probably desperately want that love and affection and can relate to much of what Gertie felt too. This passage of Gertie trying to process what it felt like for her mother living with them before she moved out really touched me " being with them was like wearing a pair of shoes that were too tight. You could limp along for a while, but your feet would just hurt more and more until you were sure that if you walked one step further in those shoes, they'd squeeze your toes off." The loneliness that Gertie must have felt being in the same town as her mother, seeing her house, even running into each other once in awhile. And now her mother was getting ready to get remarried and move away. I really came to dislike Gertie's mother. At least Gertie had her Aunt Rae at home, who always seemed to look out for her. Gertie is such a smart, lovely little girl and her optimistic personality really seems to shine through. She's the first to point out when her father tries to explain that her mother left because she wasn't happy , that "although sometimes she isn't happy about going to school, she still has to go and she's never happy about going to church, but Aunt Rae makes her go." A character that I won't soon forget. Ultimately the story is less about the reasons why Gertie's mom left and more about Gertie's realization that she doesn't need to prove anything to her mother. That she is good enough just the way she is, and she is "gleaming with greatness." Overall, a very lovely story and I look forward to seeing what Kate Beasley writes next. Thank you to NetGalley and Farrar, Strauss & Giroux (BYR) for an advanced copy of this book in exchange for an honest review. Well oh dear. I truly wish I could give this a higher rating but unfortunately this really missed the mark for me. Now obviously this is a middle-grade book so one could argue I'm not the right audience for this and I would not quarrel with that assessment. I actually would be interested to hear an opinion from the the age range for which this is written. To start, I t Thank you to NetGalley and Farrar, Strauss & Giroux (BYR) for an advanced copy of this book in exchange for an honest review. Well oh dear. I truly wish I could give this a higher rating but unfortunately this really missed the mark for me. Now obviously this is a middle-grade book so one could argue I'm not the right audience for this and I would not quarrel with that assessment. I actually would be interested to hear an opinion from the the age range for which this is written. To start, I thought this was a book written in the 1950's - it was only when it is mentioned about a child having a cell phone that I realized it was supposed to be modern day. And this left me puzzled. All the children's names are so outdated as to be noticeable and jarring: Gertrude, Junior, Jean, Roy and Mary Sue are all the main players here. There is also some contest regarding summer speeches which also felt strangely antiquated, unfair and strangely subjective. Almost the whole time I'm reading this book I'm wondering if California is so progressive (and my children's school in particular) because I had to do some serious suspension of belief that Mary Sue (and eventually the other kids) would get away with the level of cruelty and bullying they subject Gertie to. An exclusionary club (complete with picketing students and publicity on school grounds) that attacked a fellow student's family? Umm, no. A school secretary that favors some students and visibly hands them chocolates when they deliver a note? Umm, no. A school play with a starring role that is gender specific? Umm, no. Add in an unhealthy dose of precociousness and a mother who abandons her child but lives in the same town and starts a new one and it was just too over the top for me. Of course there is a happy ending here but it is too little, too late. There is an unnecessary amount of school-sanctioned oppression that it sucked what little joy there was in the book. I do think the author will find a niche with this heroine - it has some shades of Jerry Spinelli in there and I did admire Gertie's resilience in the face of overwhelming sadness but unfortunately Gertie was just not my cup of tea. Gertie has a mission. And her missions always work out. But this one, her plan to get her absent mother to notice that Gertie is “one hundred percent not-from-concentrate awesome,” is not going so well. The new girl, Mary Sue, seems to outshine ( and outsmart) Gertie in almost everything. And her mother still seems to be keen on moving away. First, Gertie. Oh, Gertie! Gertie has so much gumption and realness--Beasley has created a character so endearing and tangible, she’s sure to live on in the Gertie has a mission. And her missions always work out. But this one, her plan to get her absent mother to notice that Gertie is “one hundred percent not-from-concentrate awesome,” is not going so well. The new girl, Mary Sue, seems to outshine ( and outsmart) Gertie in almost everything. And her mother still seems to be keen on moving away. First, Gertie. Oh, Gertie! Gertie has so much gumption and realness--Beasley has created a character so endearing and tangible, she’s sure to live on in the pantheon of of kid lit heroines--Ramona, Matilda, Harriet, Anne, Pippi, etc., etc. She’s a little weird, she’s determined, and her heart is larger than even she realizes. You, dear reader, will love her. Gertie’s fight to become the “best fifth-grader in the universe” overlays her deeper longing to bring her mother back where she thinks she belongs--back with Gertie and her father. The profound cruelty Gertie encounters from her fellow students on her quest--bullying catalyzed by Mary Sue and intensified as more students (all too easily) join in--is heartbreaking in its accuracy. Beasley deftly explores the subtle unkindnesses that can break children down, utilizing perfectly quirky humor and a brave little protagonist to keep the story from getting to heavy to bear. Gertie's Leap to Greatne Oh, Gertie. This book broke my heart into a million wee pieces. It's really a wonderful book, though. A story that's readable and sweet, but ultimately on the slight side for me. Positives: I loved the narrative voice and the charming illustrations, which reminded me of TALES OF A FOURTH GRADE NOTHING (and also illustrated several characters as POC, though they're not specifically referred to as such); realistic handling of difficult subjects, especially the mom who abandoned Gertie and Gertie's conflicted feeling about her dad's job on an oil rig; non-nuclear family unit (Gertie lives with her A story that's readable and sweet, but ultimately on the slight side for me. Positives: I loved the narrative voice and the charming illustrations, which reminded me of TALES OF A FOURTH GRADE NOTHING (and also illustrated several characters as POC, though they're not specifically referred to as such); realistic handling of difficult subjects, especially the mom who abandoned Gertie and Gertie's conflicted feeling about her dad's job on an oil rig; non-nuclear family unit (Gertie lives with her aunt, and her dad is away for his job for long stretches of time); and best of all, the familiar outrages and embarrassments of being in school, including unfair treatment, fixating on another kid who always seems to get her way, not being able to help yourself from doing something wrong, and feeling betrayed by a friend. And Gertie herself, who is not afraid of resuscitating frogs, is just delightful. Less successful: I was willing to believe in Gertie's unlikely quest to win over her estranged mom, but somehow that never came together convincingly for me until near the end with the play. (Although again, I appreciated how that played out.) Like all kids, Gertie was also selfish at times, but unlike the competitive scenario with Jean, she also rarely listened to Junior, and I don't think that was followed through very well--that is, I don't think she really noticed it. (The Mary Sue lesson was, as expected, a solid one, however.) And although I liked the writing style and dialogue, I think the book and characters start strong but don't finish with as much humor or wisdom or heart as they had the potential to. So, a quick and enjoyable read, but not something I'd be likely to read again. But I'd check out another book by this author down the road. I loved this book! I would love to know Gertie! She is such a delightful girl, and I was rooting for her all the way. I look forward to sharing this book with students. I received an early digital copy from NetGalley. A little Harriet the Spy (especially the school play), a little The Penderwicks, with a dash of Fannie Flagg. I had a little trouble warming up to Gertie, but I think middle graders will like her. If you like Ramona Quimby, you will love Gertie Foy! Fifth-grader Gertie Reece Foy is determined to make the leap to greatness, thereby winning the attention and admiration of her absent mother in this engaging middle-grade novel from first-time author Kate Beasley. Although raised by her father and her Great-Aunt Rae, Gertie is used to having her mother, the elegant Rachel Collins, who still lives in the same Alabama town that Gertie does, appear as a distant figure in her life. But when a 'For Sale' sign appears outside Rachel's house, Gertie, w Fifth-grader Gertie Reece Foy is determined to make the leap to greatness, thereby winning the attention and admiration of her absent mother in this engaging middle-grade novel from first-time author Kate Beasley. Although raised by her father and her Great-Aunt Rae, Gertie is used to having her mother, the elegant Rachel Collins, who still lives in the same Alabama town that Gertie does, appear as a distant figure in her life. But when a 'For Sale' sign appears outside Rachel's house, Gertie, who has never so much as exchanged a word with this mysterious mother, determines that she will make herself known, and cause the woman who abandoned her to regret leaving her behind. But things rarely go exactly as planned, and Gertie quickly discovers that newcomer Mary Sue Spivey, a transplanted Californian, and the daughter of a filmmaker to boot, is also determined to be the best fifth-grader ever. In the process of fulfilling her "mission," Gertie begins to concentrate so much on what she doesn't have that she starts to forget what she does, alienating friends and family in the process. Will Gertie succeed, or will she discover that there are all kinds of greatness...? Thanks to Net Galley and Kate Beasley, I’ve now met wonderful Gertie Reece Foy who lives with her wise Aunt Rae and her loving father. He’s gone for two weeks before returning for two weeks because he works on an oil rig, but the scenes with him show wisdom, too. Gertie has strength from family, although her mother left them early in Gertie’s life, but still lives in the same town, is about to re-marry and move. Gertie leaps into the story with a bullfrog, certain that this time she will have th Thanks to Net Galley and Kate Beasley, I’ve now met wonderful Gertie Reece Foy who lives with her wise Aunt Rae and her loving father. He’s gone for two weeks before returning for two weeks because he works on an oil rig, but the scenes with him show wisdom, too. Gertie has strength from family, although her mother left them early in Gertie’s life, but still lives in the same town, is about to re-marry and move. Gertie leaps into the story with a bullfrog, certain that this time she will have the “greatest” summer speech on the first day of school. Every student at her school gives those speeches, required stories of summer. As we learn soon, Gertie thinks she isn’t the smartest or the fastest or the tallest, but she knows herself well. Gertie Reece Foy never gives up. However, each time Gertie has a mission, somehow it seems she must overcome adversity, like that new and pretty Mary Sue that’s moved to town, that one that seems up against all Gertie is aiming to accomplish. The web of fifth grade friendships breaks down because of Mary Sue, and Gertie is hanging on by only one thread, her biggest mission to do the greatest at something, anything. All that’s left of her mother is one locket and briefest of memories while growing up. Gertie wants to be able to do that something so she can go to her mother’s house and let her know she hasn’t been needed at all, because Gertie has become the greatest anyway. No one understands this until she confides in her steadfast friend, Junior, who also never stops being her friend. I’ve been told that if you have one good friend, that is all you need, and it counts a lot in this story. Aunt Rae’s matter-of-fact love counts a lot too, and both together buoy Gertie so she can keep on, sometimes sadly, sometimes desperately. She is not perfect, after all, but wow, she does make her leap to greatness. The book is complex without seeming so. Those young middle graders who read this book might especially cling to Gertie’s secrets, knowing they too have them. And they will see that in spite of everything, there are things that count that perhaps have been overlooked. I loved the characterizations, the hint that every child has a story that calls to us to want to discover more. Kate Beasley shows that she knows fifth graders well. Note: this review is written by my husband, Evan. That’s what Royal Tenenbaum (Gene Hackman) tells his crying adolescent daughter after insulting the play she wrote and produced all by herself, in The Royal Tenenbaums. The line is both hilarious and tragic, because a parent is never just another person. Fifth grader Gertie knows this all too well. Gertie lives with her aunt, while her mother - for reasons unknown to her - lives in a house on the other side of town, having completely removed herself from Gertie’s life and upbringing. Gertie’s journey in this book starts when she sees a “For Sale” sign on her mother’s lawn. Suddenly, Gertie makes it her mission to become the best fifth grader ever, because this is her last chance to prove to her mother that she doesn’t need her - she is doing just fine on her own, thank you very much. Oh, and nice job abandoning such an amazing daughter, ya dummy! At least that’s how Gertie spins it, but it’s obvious to everyone around her that she just wants her mother to be proud of her. Gertie perfectly captures the contradictions and complexities of being a tween, and she expresses herself in a delightfully creative way. In Gertie’s inner monologue, you would think that she is incredibly confident. She considers herself to be extremely talented and smart - especially when her hair is in a ponytail, thus causing the blood to rush to her head and make her even smarter. But her own view of herself can only get her so far, when that “one person’s opinion” - her Mom’s - is absent. I can imagine some people finding Gertie’s character annoying, in which case this book might not be for you. But I loved her. This book also has great illustrations by Jillian Tamaki, a villain you love to hate, and some well-developed side characters (not to mention a zombie frog). But Gertie is truly the star. I was with her on her journey all the way. A fun and emotional read. I knew I would love Gertie's Leap to Greatness based on the title alone. It sounds presumptuous, but I have a soft spot for girls with very quirky names who put a lot of gusto into everything they do. It also reminds me how boring my name is. Kate Beasley's debut is a delight, and it's a delight because of how everything is set up from page one. Gertie isn't like other little girls -- she wants to resurrect a frog back from the dead, wants to be the star in the school play, and she was that darn Mary Sue to stop stealing her seat. She is 100% made of awesome, and she's the kind of girl that you can easily cheer for. If I am being honest, I saw a lot of my younger self in Gertie. I still have the same can-do attitude towards life (or at least when it comes to the things I love), I was that awkward child who would only be afraid of what people thought after the fact. Gertie's got so much charm and spirit that she was just such a fun character to follow about. I also LOVED Gertie's aunt and the role she played in the story as well, especially in regards to Gertie's relationship with her mother. I think what I equally loved about this novel is that the voice present in it feels so genuine and realistic. While a zombie frog doesn't scream realism, I appreciate how full of life Gertie and her family are. While some of the other characters feel a little more one note, there's still something so compelling about what is happening the story and what surrounds Gertie as a character. It makes for quick read, that's for sure! 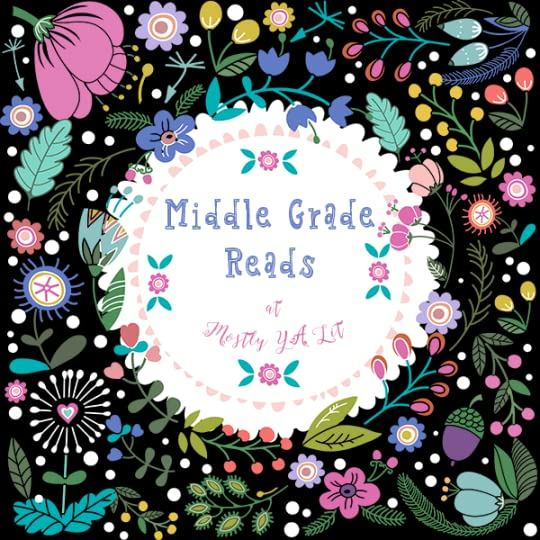 It seems to become harder and harder to find books that really fit the audience of kids who have progressed beyond "chapter books" but aren't yet ready for a lot of the heavy content that characterizes so many books that are being described as "middle grade." GERTIE'S LEAP TO GREATNESS, however, will fit that audience pretty well. Sure, Gertie has a fairly heavy problem -- a mother who moved out and seems to be doing her best to pretend that her marriage and her daughter never happened. But Gert It seems to become harder and harder to find books that really fit the audience of kids who have progressed beyond "chapter books" but aren't yet ready for a lot of the heavy content that characterizes so many books that are being described as "middle grade." GERTIE'S LEAP TO GREATNESS, however, will fit that audience pretty well. Sure, Gertie has a fairly heavy problem -- a mother who moved out and seems to be doing her best to pretend that her marriage and her daughter never happened. But Gertie also has very common and relatable problems, like trying to maintain her status in her class when so many people are fascinated with the snooty new girl. Fortunately, Gertie is also a funny kid, with funny friends, and readers will find plenty to laugh at while the problems are being resolved. Granted, it's a pity that the famous resuscitated frog plays a fairly minor role in the story, but Gertie's human friends also provide great support. Particular kudos go to Junior Junior (he's named after his dad, whose given name is Junior), who deserves the Neville Longbottom Award for Best Performance of a Hapless Sidekick in a Less Minor Role Than He Would Really Have Preferred, for his attempted infiltration of the party to which Gertie was pointedly not invited. Readers will probably also enjoy Tamaki's interior illustrations, although the cover design is a weak point. Gertie is shown very small against the background scene, and in this drawing looks more like a 5 or 6 year old rather than the 5th grader she really is. Having her look so young on the cover will make this book harder to "sell" to readers at the older end of its audience. Still, readers who have enjoyed the gentle Southern humor of Deborah Wiles's Aurora County books will find another welcome companion in Gertie. Gertie has a mission to become the best fifth grader in the whole world, and when Gertie's starts a mission, she always finishes it. The only problem is that seat-stealing new girl, Mary Sue. it doesn't take long before a full fledged rivalry flares up between Gertie and Mary Sue. Gertie's character is full of life and personality. From the way she dresses to the way she plans her missions, she is the kind of girl I would have loved to buddy up with as a kid. She has tons of energy and laser shar Gertie has a mission to become the best fifth grader in the whole world, and when Gertie's starts a mission, she always finishes it. The only problem is that seat-stealing new girl, Mary Sue. it doesn't take long before a full fledged rivalry flares up between Gertie and Mary Sue. Gertie's character is full of life and personality. From the way she dresses to the way she plans her missions, she is the kind of girl I would have loved to buddy up with as a kid. She has tons of energy and laser sharp tunnel vision when it comes to her mission. Even though she tries and fails several times, she keeps trying and never gives up. I gave Gertie's Leap to Greatness to Miss K and she loved it. She read the entire book in a couple of hours and had to tell me all about it. I love it when we can both read a book and then discuss it afterwards. It gives us something in common and something to bond over. And this story doled out laughs, tears, and lots of excitement. Content: Quite a bit of taking the Lord's name in vain. Source: I received a digital galley of this book from NetGalley in exchange for an honest review. 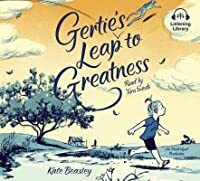 Gertie's Leap to Greatness by Kate Beasley was more than great! Gertie aspires to be the greatest fifth grader, but it isn't for reasons you expect. Follow her on her journey as she stumbles through trying to make meaning of something that is beyond a child's understanding. With humor and compassion, Gertie's journey is one that will tug at your heart and have you cheering as you turn the page! Middle grade students will easily connect to Gertie. They will find themselves laughing out loud and cr Gertie's Leap to Greatness by Kate Beasley was more than great! Gertie aspires to be the greatest fifth grader, but it isn't for reasons you expect. Follow her on her journey as she stumbles through trying to make meaning of something that is beyond a child's understanding. Gertie resembles anyone who has ever tried so hard to prove themselves to others. She is the epitome of what it means to be a young person trying to find their place in the world, but what Gertie realizes is being herself all along was the best route to take. What a fantastic novel reminding children to stay true to who they are. I would recommend again and again to my students. This was a a cute book, and one that would be excellent for middle-grade readers. Gertie is on a mission to be the best fifth-grader in the universe, so that she can show the mother who abandoned her that Gertie does not need her. The problems and behaviors are quite accurate for a bunch of fifth graders, and I enjoyed it from start to finish. I love this book's humor, sadness, and it's irreverence. Don't let the cutsie cover fool you--this book has sass! Great medicine for a tough post-election week. As the book jacket says, Gertie Reece Foy is 100% not-from-concentrate awesome. I read this with my 3rd grade daughter for a foam pumpkin project she'll be completing next month. Gertie is a spunky fifth grader who has had an unusual life. Her mother left her when she was little but lives in the same town, her dad works on an oil rig, and she's raised by her Aunt Rae. Gertie sets out to prove she is the most amazing kid in fifth grade, and doesn't need her mom anyway. Her competition: new girl Mary Sue Spivey, a rich and popular girl whose dad is a film director and mom is I read this with my 3rd grade daughter for a foam pumpkin project she'll be completing next month. Gertie is a spunky fifth grader who has had an unusual life. Her mother left her when she was little but lives in the same town, her dad works on an oil rig, and she's raised by her Aunt Rae. Gertie sets out to prove she is the most amazing kid in fifth grade, and doesn't need her mom anyway. Her competition: new girl Mary Sue Spivey, a rich and popular girl whose dad is a film director and mom is an Environmental rights activist. Gertie must navigate her pre-adolescent feelings of jealousy and insecurity, while learning to deal with her changing friendships and the upcoming school play. Gertie is distinctively described, which will make her features perfect for creating the "pumpkin" face. Freckles, wide nose, big smile, high ponytail, she also sports a locket necklace. A rubber frog will complete the project, as a frog makes a brief appearance at the beginning and end of the story. This book was cute, and I appreciated it more after I discussed it with my daughter. While my initial reaction was "It was okay", I think Beasley did a commendable job in showing the reality of some kid's lives. It's important to create relatable reads for different kinds of families. Sometimes moms don't come back. Sometimes dads have to work a lot. I selfishly wanted the fairy-tale ending, but the events that occurred in this book will ring true and have more of an impact on those who might need it. Gertie is indeed great, and I liked how her character evolved over time- choosing kindness while realizing the grass isn't always greener on the other side.